The year is 1919, and four-year-old Rachel Rabinowitz and her older brother Sam live a frugal life with their parents in a tenement in New York City’s Lower East Side. When their mother dies in a tragic accident, their father flees and Rachel and Sam become wards of the state, separated into different orphanages. At the Infant Home, Rachel and the other orphans are unwilling subjects in medical experiments, including one by Dr. Mildred Solomon involving unprotected exposure to X-rays. Left scarred and bald from X-ray treatments, Rachel is eventually moved to the same orphanage as her brother, where she endures years of taunts from the other orphans. Decades later, Rachel is a nurse at Manhattan’s Old Hebrews Home when she encounters Dr. Mildred Solomon again. This time, Rachel is the care provider and Dr. Solomon the patient, an old woman emaciated by the cancer that will soon kill her. Obsessed with making Dr. Solomon acknowledge her wrongdoing, Rachel must choose between revenge and mercy when confronted with the power of both. Orphan Number Eight was one of my most-anticipated books from BEA (both pre-BEA when I was looking at what I could pick up and post-BEA when I had to decide which of my 50+ ARCs to read first! ), and it definitely deserves its spot on both lists! It has all the elements of a good story: great character development, an interesting and engaging narrative style, an intriguing plot (with just enough romance thrown in to be interesting but not off-putting), and an obvious talent for historical research. The plot itself is mostly well-paced and kept me turning pages. For me personally, what interested me about this story initially was the horror aspect: little girl is a victim of medical experimentation, is left deformed, and later in life gets a one-in-a-million opportunity to confront the person who maimed her. But the plot isn’t the only thing that kept me reading; I was fully immersed in the history, the characters and their relationships with each other, and in Rachel’s personal development. I generally find historical fiction to be a bit dull, but Orphan Number Eight is anything but. The chapters alternate between Rachel’s first person narration as an adult working at the Old Hebrews Home and third-person narration that usually focuses on Rachel as she grows up, but occasionally jumps to the adults in her life, mainly staff at the orphanage and an occasional interlude from Dr. Solomon. Getting these intermittent glimpses into others’ observations of Rachel really rounds out the story, which I love—the more details and perspectives I get when I read, the better! An interesting narrative choice, certainly—especially switching from third to first person narration when switching timelines—but it worked well, even though it was slightly jarring at first. Rachel’s growth from a scared toddler, alone in the world, to grown woman who is determined to atone for all the wrongs she has done is a fantastic character study. An additional dimension I didn’t expect is Rachel’s gradual realization that she is gay; considering the time period of her story, this affects her life in ways that are much less prevalent today (though unfortunately still more common than they should be). The best part about this aspect of Rachel’s character is that it wasn’t done to be “edgy” or “progressive” or to check a “diversity” box; it’s simply who Rachel is, no more and no less. I haven’t read many books with LGBT characters, let alone protagonists, so this was a refreshing change and a new perspective that I really enjoyed. 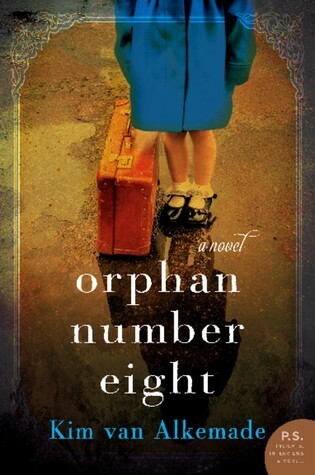 If you’re looking for a book that combines history, romance, and horror and will keep you turning the pages, you should add Orphan Number Eight to your list! I picked up two ARCs of Orphan Number Eight at BEA. One, signed by Ms. Van Alkemade, is sitting on my special-books shelf 🙂 the other is up for grabs! Enter below for a chance to win an ARC of Orphan Number Eight, published tomorrow by William Morrow! Ends Sunday, August 9th at 11:59pm. US only. Thanks for wonderful review can’t wait to read.